← Relationship: We Still Ain’t Free? See if you can figure out this relationship situation. It happened right in front of my building. The Saturday afternoon of Mother’s Day weekend, there was a female voice I heard yelling on the block. It was not directly in front of my building, but the voice was so loud, so strong and so demanding. I had to see what was going on. There was this brother, 6 feet, and 135 pounds, standing in front of my building, expressively trying to talk to a woman who was down the block, way in front of him, and out of my window’s view. I could not see her, but I could definitely hear her. He shrugged, waved her off, and said, “I don’t wanna go. You don’t wanna hear what I’m saying, so you go.” He turned around, and started walking the other way, back to where he came from. “LET’S GOOOOOOOOOOO!” She said it again, but she held the word ‘go’ as if it was an echo. The little girl ran back to her Mother, who by this time had walked up in front of my building, with two other darling little girls holding her hand, yelling to him, who by this time, he had left my window’s view. She barked, “LET’S GOOOOOOOOOOO! I CAN’T HANDLE THEM BY MYSELF!” Her vocal power was supported by the height of 5’2 and 195 pounds. Those were her words as she turned around, with her girls, and proceeded back up the block where she was headed before, with him quietly walking with her, as he stared silently at his phone. And that was that. They went on with the obvious normalcy of how life is in their relationship. The three little girls did not seem at all surprised at the loud words coming from the mouth of their Mommy. As a matter of fact, they looked at their Dad, as if to say why was he taking so long. Clearly, this type of communication is what they are accustomed to. Yep! You know it. There is a communication problem and a lack of respect in that relationship. 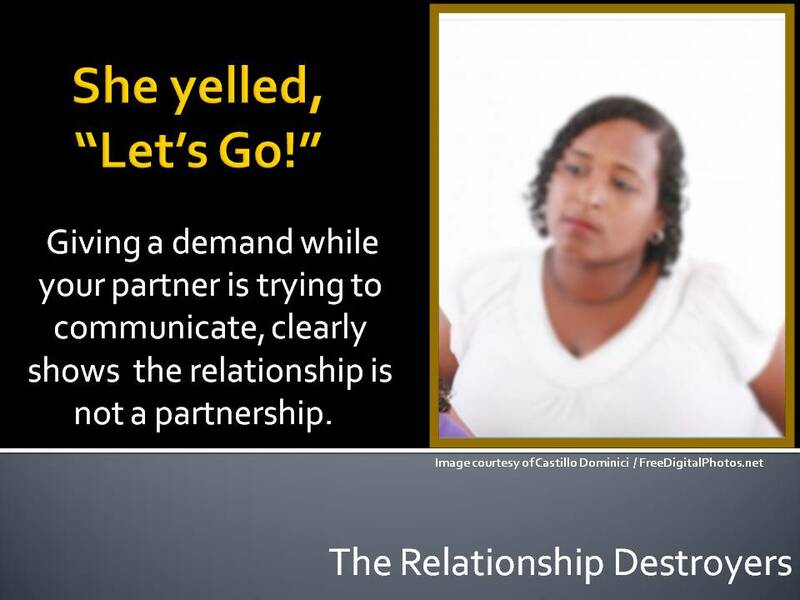 Giving a loud demand, while your partner is trying to communicate, clearly shows it is not a partnership. This situation implies dictatorship. There is very little understanding. If understanding was a part of their relationship, she would have stopped yelling her two word dialogue and would have been willing to listen. With her bellowing, and him maintaining composure, despite her verbal and public emasculation of him, tells us that when she is upset about anything, she does not communicate much about it. She yells about it. She does not talk very much to obtain solutions either. If her man has a problem, she doesn’t listen or provide much support. She expects him to move on and get over it. He validates her behavior by abiding to a two word demand. That day was not his first time dealing with that. What are they teaching those beautiful girls? It is okay to yell down the street and allow the entire block to see your relationship, while leaving it open for speculation. They are both teaching those babies about communication. The messages’ cues are: don’t communicate, just yell out loud and he will do what you say. What are they both teaching regarding the treatment of men? The message is, don’t hold him in high regard. Don’t listen to him. What he feels or says is not important. Don’t respect him. Emasculate and humiliate him in public in order for him to submit to what you want. Through his obedience to her demand, he is validating her behavior. Although he is showing some respect, because another type of man may have belted her in her loud mouth. But then again, those types of women do not have relationships with men who would belt them in the mouth. They definitely know who NOT to yell at. The evidence of three beautiful girls is also very telling. He gave his woman three babies. Even though he is not happy with her, he had three beautiful baby girls with her. Eventually, if he hasn’t already, he may step out to another woman, who is willing to listen and will lovingly encourage communication. He will stay in the relationship with the “Let’s Go” woman, because he knows his beautiful daughters need and love their father. The words “Let’s Gooooooooooo” do not belong in a relationship, as an override or a position of dominance to an issue or problem. It is very appropriate for a competition or a race, where a group may need loud and aggressive encouragement. Otherwise, the words, “Let’s Go” has gotta go!!! This entry was posted in Actions in Relationship and tagged a partner who yells in a relationship, disrespect in a relationship, emasculating a man in the relationship, my partner will not listen. Bookmark the permalink.